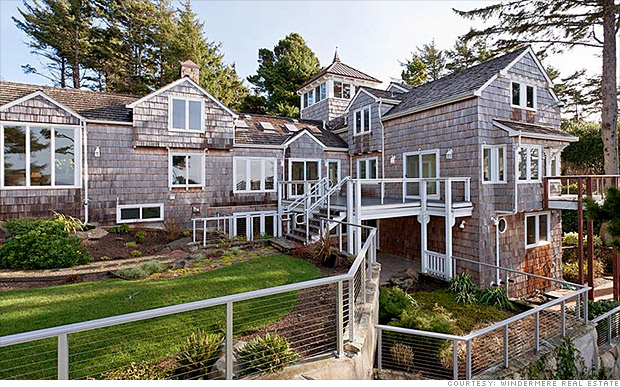 For under $2 million, you can get a whole lot of vacation home. This rambling four-bedroom contemporary is crammed with charming nooks and architectural touches. The interior resembles a rustic retreat with high, wood-paneled ceilings and stone work. There are several fireplaces and wood stoves, a wine cellar, a wet bar, a guest house, even room to park an RV. But now for the best part: location. Game: What super rich celebrity do you spend like? The home is situated on a wooded lot of more than an acre, with commanding views of Oregon's rocky shore. Nearby is Yaquina Bay and several state beaches and parks. The home has been on and off the market since 2012. Originally listed at $2.6 million, it has been marked down by more than a third since.